Trouble Getting Home Buyers to Find You Online? I have received a number of calls and emails in the last couple weeks asking about NewHomesDirectory.com. Several inquiries about the service and also about the nature of Lasso's partnership with NewHomesDirectory.com. Builder marketing and sales executives have repeatedly told us over the past couple of years that quality traffic is a major issue – whether it is referral, walk in, traditional ads or from online sources. And while most builders have invested in website technology (often substantial amounts), most are not aware of the challenges of getting found online. That is, the trouble in getting found by prospective consumers on Page 1 of Google (or Yahoo or MSN). NewHomesDirectory.com does a terrific job of organic search engine optimization (SEO), catering to the 75% or so of prospective home buying consumers that start their search for a home on the internet. 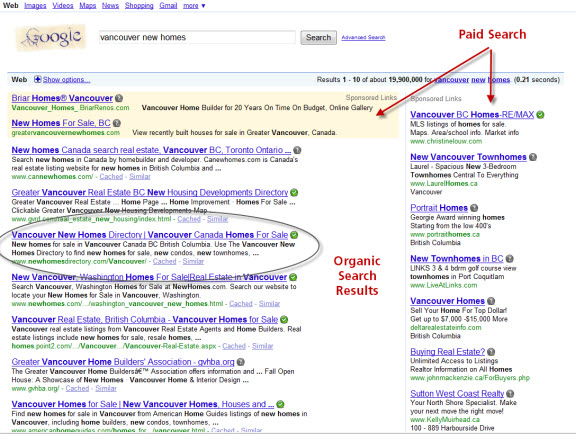 The directories, organized by city, create a simple landing place, typically on page 1 of Google (see the image below where the Vancouver Directory places in the 3rd spot in Google's search for “Vancouver New Homes“), for consumers to click through to a comprehensive listing of new home communities and projects by region, by builder and by price categories. Plus, it is really easy for consumers to navigate because the directory is exclusive to new homes (no resale or rental listings), has no banner ads or other typical distractions. It is purposely a very simple site. So for home builders that are interested in generating more traffic, especially of high quality, we think NewHomesDirectory.com is a natural, and very economical, extension of their advertising and online marketing strategy. And at $2/click with a monthly cap per community it is impossible to go over budget. At Lasso we have historically been all about Real Estate CRM technology to capture, target and close prospects. Now we are extending our reach to offer additional services that will help developers and builders market and sell their projects. We think helping them drive more quality traffic and also providing our expertise in online marketing ultimately helps with the number 1 priority – More sales!